GOE foolproof pie crust: 2 1/4 cups pastry flour 1/4 cup butter 1/2 cup crisco (the solid shortening) Pinch of salt Use a pastry blender and by hand work the ingredients above into a ball. Add 1/3 cup ice cold orange juice and continue forming a dough ball. Use some extra flour on a wooden board and roll out dough to desired size. 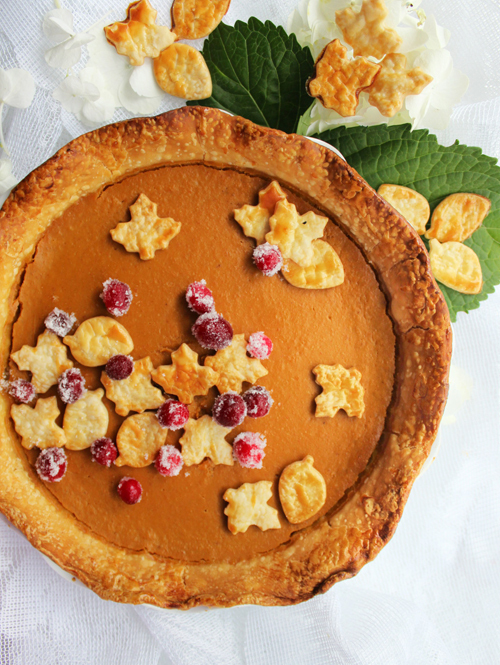 OPTIONAL BUT TOTALLY CUTE: pie crust leaves Use excess dough to make your leaves with pie cutters. Brush with egg wash (1 egg beaten with 1 tsp milk). Bake on silicone sheet or parchment at 350F for 10 - 12 minutes. Kick up the oven temp to 425°. To prepare filling, combine first 8 ingredients in a large bowl, stirring with a whisk. Add pumpkin, and stir with a whisk until smooth. Prepare crust, roll dough into an 11-inch circle; fit into a 9-inch pie plate coated with cooking spray. Fold edges under and flute. Pour pumpkin mixture into the crust. Place pie plate on a baking sheet. Place baking sheet on lowest oven rack. Bake at 425° for 10 minutes. Cover edges of crust with foil to prevent burning. Reduce oven temperature to 350° & bake an additional 50 minutes or until almost set. Cool completely on wire rack. Garnish with pie crust leaves & sugar coated fresh cranberries.